Ranch dressing, I think the culinary world would be a much sadder place with out you. It pairs great with just about anything from chicken and potatoes to salads. 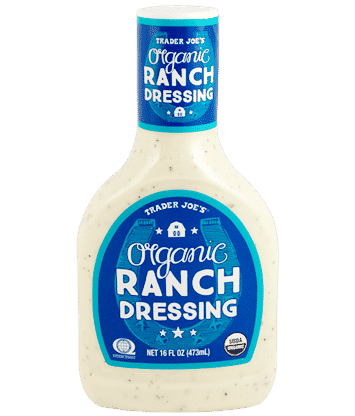 I just can’t get enough of the new Organic Ranch Dressing from Trader Joe’s, I think it’s safe to say I have a healthy obsession with ranch from time to time. I want to share some of my favorite ranch dressing recipes starting with this Quick Crispy Cheddar and Ranch Chicken Strips. Other healthy obsessions I believe I have include, coffee, wine, chocolate, bacon and The Bachelor. Have you been watching recently? *SPOILER ALERT* Ben is by far one of the most lovable bachelors in the history of the show, he’s just so respectful, loving and kind. On this weeks episode he let the single mom, Amanda, go home. Even while confessing to her that he was not in love and had a stronger connection to other women, he remained unbelievably sweet and respectful. I can not wait for the final episodes to come, I will be watching intently with my glass of vino in hand and chocolate of some sort. The ranch dressing adds flavor and keeps this chicken oh so moist while it bakes. The combination of crispy cheddar crackers mixed with panko bread crumbs deliver a perfect crunchy crust. This quick impromptu dinner took all of five minutes to prepare and only twenty five minutes in the oven before my toddler and I devoured all we could stomach. I’m not really sure why he requested to eat them with barbecue sauce, but to my surprise when I dipped the chicken in the sauce it was pretty darn tasty. I’m highly recommending the new Organic Ranch Dressing from Trader Joe’s and this easy chicken recipe for all ranch dressing lovers. « The last day to donate!! !